This statistic depicts the value of global mining and metals sector deals in 2017, by targeted region. In that year, in the Asia-Pacific region there were such deals worth some 9.9 billion U.S. dollars. 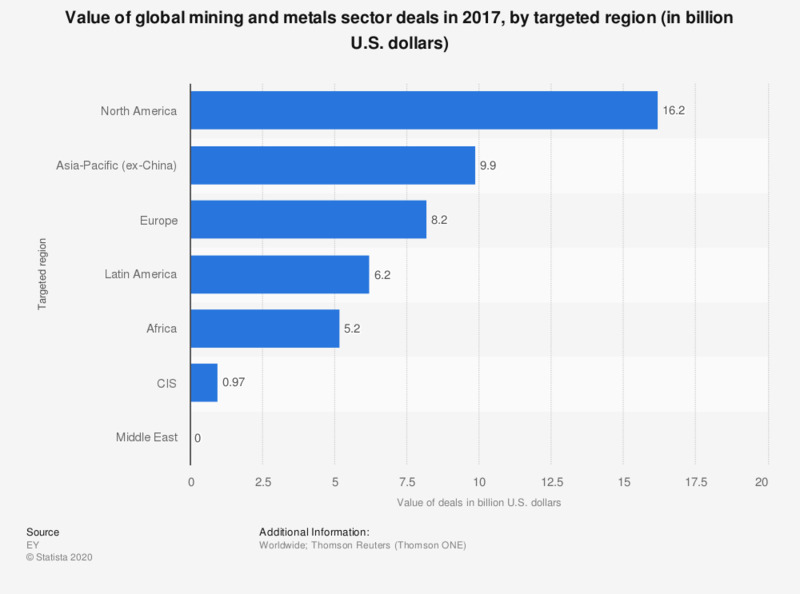 In 2017, deals made in the mining and metals sector totaled 16.2 billion U.S. dollars in North America and 6.2 billion U.S. dollars in Latin America. During this time, the global number of deals for gold was the highest in this sector, totaling 117, while coal deals, with the second highest number of deals in the sector, totaled 38. In 2015, the main drivers for mergers and acquisitions in the gold industry were non-core divestment, debt reduction, and strategic growth, according to Ernst and Young. Despite gold being at its lowest annual average price since 2009, gold was the most valuable targeted commodity (by cumulative mergers and acquisitions value) in the global mining and metals sector in 2015, at 13.9 billion U.S. dollars. It is predicted that many mid-sized companies will be active buyers in the industry in the next years. The value of deals has fluctuated over the last decade from about a low of 26.4 billion U.S. dollars in 2004 to a high of 210.8 billion U.S. dollars in 2007. Opening of new mines has also provided companies with a larger source of income which has driven the sector’s mergers and acquisition deals. In 2010, among emerging countries, about 28 percent of mining and metal acquisition deals were from Brazil. CIS = Commonwealth of Independent States.